Description: Wingspan 22-27mm. A small, very distinctive moth. Predominantly white in colour with a greyish blotch on the forewing. The resting adult has a remarkable resemblance to a bird dropping. A cryptic species resembling a bird dropping when resting on foliage. Very easy to recognise due to combination of size, colour and distinctive resting posture with wings held folded in high arch. Flight Period: Mid-May until the beginning of September. Status: Common and widespread in southern counties, less evident in the north despite suitable habit. Ecology: A curiously shaped moth that favours woodlands, hedgerows and scrubby habitats. Adults come to light in small numbers and are occasionally found or beaten from foliage during the day, where they have a tendency to drop into the vegetation rather than fly. The larvae feed mainly on hawthorn and blackthorn although they have been reported on bramble, apple and pear. 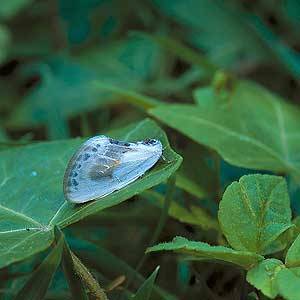 It spends the winter months in the pupal stage among leaves or cracks and crevices in bark.